Sweet potatoes are so, so good. 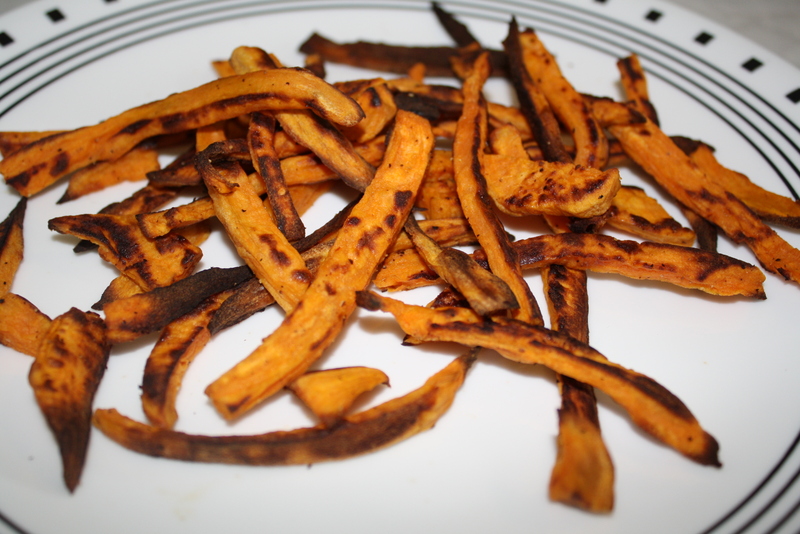 When Zack and I lived in an apartment, I would buy sweet potato fries from the freezer section (GASP! I know!). The thought of doing that now is embarrassing. Making your own makes them a thousand times better. Don’t judge these entirely from the pictures, though. Try them for yourselves. The dark parts are not burned, they are just cooked thoroughly. The dark parts make them crispy and delicious. Cooking at such a high temperature (450 degrees) means you really have to watch them, so that they don’t burn, but believe me, it is worth the diligence. Sweet potatoes complement the fall season so well. Just another reason to eat some! Preheat oven to 450 degrees. Peel potatoes and cut into matchsticks about 1/4″ to 3/8″ wide. Place potatoes in a large bowl. Add oil, salt, and pepper and toss until coated. Spread potatoes on baking sheet in a single layer and bake for about 10 minutes. Rotate baking sheet and gently turn over potatoes. Continue baking about 1o minutes or until crisp. Watch potatoes and turn frequently to prevent burning/sticking to pan (a little black on them does not make them taste burned – just gives them more flavor). Serve immediately. Oh I love these! I also like carrot fries, really similar and so good! I’ve never tried carrot fries, but I bet they’re good! Thank you. Yum! Those are absolutely mouth watering! 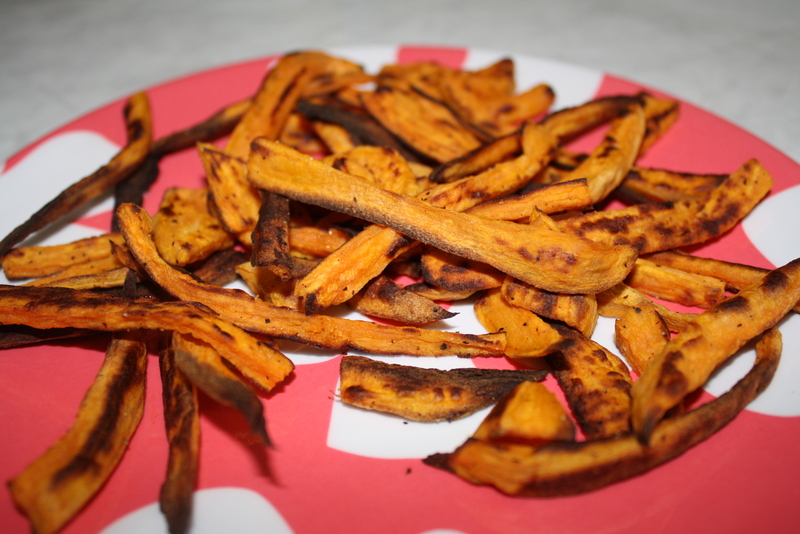 Sweet Potato fries are one of my favorite! Thanks for sharing! I love, love,love sweet potato fries! This is such a healthy way to make something that your kids will devour. I love them too! I bet they are great with kids. Thank you! I made these the other night and they were SOOOOOO GOOD! My daughter and I snarfed them down. Mmm…thanks for the awesome recipe, these are going into my favorite recipes. I am really diggin’ them and so is my daughter! What a great healthy way to get this super food into our diet. Thanks again!